Timothy James Mulligan, 30, of Stratford, proposed to his girlfriend Daniela Funicello at New Canaan Library on Dec. 3. NEW CANAAN — Timothy James Mulligan, 30, had been looking for a romantic way to propose to his girlfriend for nearly two months when, frustrated at his desk at Le Boudoir, he looked up and found inspiration. “I was looking online trying to get a sense of where and how I should do it. I couldn’t find a unique way. Then I looked across the street and saw these huge-paned windows (at the New Canaan Library). I thought it would be awesome if I could propose there,” Mulligan said. The moment was captured on video — posted to the library’s Facebook page Monday afternoon — and showed Mulligan standing in the library’s second floor window, facing Le Boudoir, where Funicella, 28, also works. 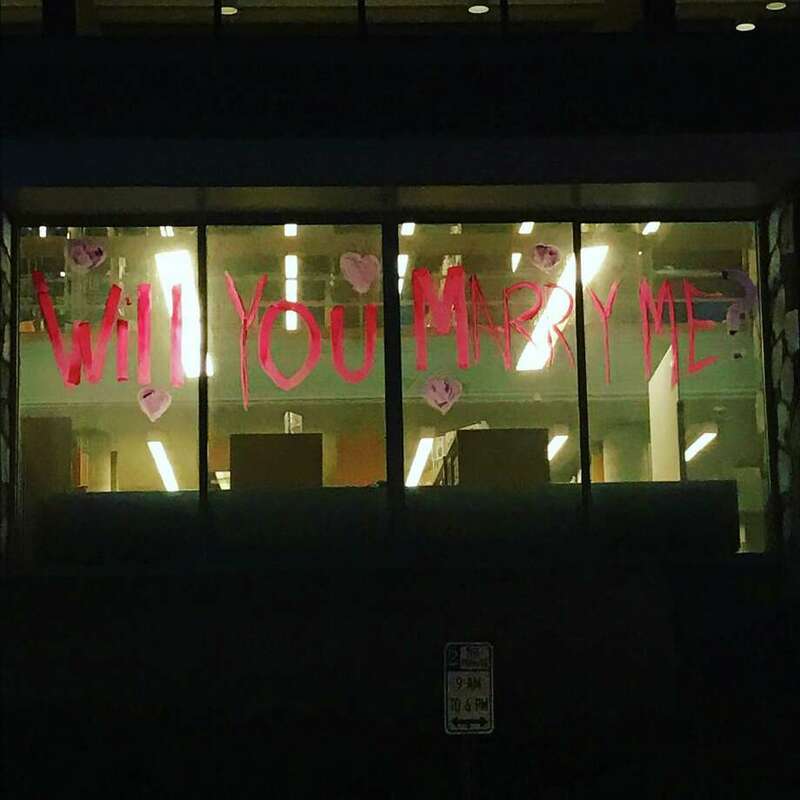 Written on the library windows in pink marker was the phrase “Will You Marry Me?” As shown in the video, Funicello, overcome with emotion, accepted. “Everyone at the Library was thrilled that we had a little part in this happy event,” said the library’s Customer Service Officer Kathy Blance, who helped to organize the proposal. According to Blance, she was joined by fellow library staffers Christle Chumney, Tina Kennedy and Becky Williams in planning the proposal, from asking permission to filming. According to Mulligan, the couple, who are looking to move to town, are planning for a fall 2017 wedding, hopefully somewhere in New Canaan with a waterfront view.